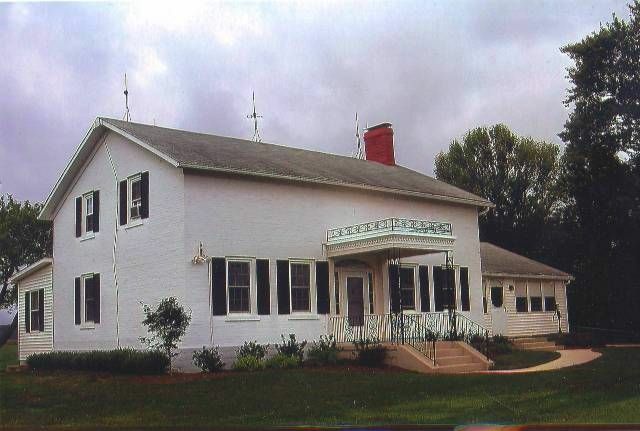 This country home is located 3 and 1/2 miles east of the historic village of Milan, Ohio. Being close to Lake Erie, it is an easy drive to Cedar Point, the large water park, Kalahari, public beaches, restaurants, shopping, boat rides to Lake Erie Islands and looking for antiques. Edison birthplace is located in Milan along with a lovely historic museum. Hiking and bird watching can be done in the Erie Metro Park system. Fishing and water sports are available in Huron and Sandusky. Concerts are held in some of the parks in Sandusky, and Huron. There are many golf courses in the area. The Huron Playhouse offers plays in the summer usually through July. It is equal distance to Toledo and Cleveland. Enjoy a day in Cleveland to see the Rock and Roll Museum or take in a baseball game at Jacob's Field. After a busy day of activities find relaxation in a serene, nicely furnished, comfortable nine room country home with a big yard completely surrounded by farmland. I am a retired school teacher. I am the fourth generation owner of the property. The house was built in 1849 and has had many changes made to it since that time. My father was a farmer and I worked on the farm until I graduated from college. We specialized in growing sweet corn but now raise soy beans, wheat, and field corn. The property has special meaning to me since it is where I grew up. It is in a safe, quiet location in the country, but close enough to towns to grocery shop, and buy most anything you would want. Being within 5 miles of Lake Erie is great because of the many activities the Lake area offers. This nine room house is very clean which allows families to spread out during their stay. The kitchen is modern with dishwasher, microwave, and is well equipped. Outside is a patio, chairs, charcoal grill, and fire pit. The backyard is very large for children or others to play in. The area is safe and being in the country it is surrounded by farmland and it is quiet. One bathroom is upstairs and one is downstairs. Public sand beach in Huron, OH on Lake Erie. It is called Nickel Plate Beach. 3.5 miles from the village of Milan, OH. Visit home of Thomas Edison or the excellent Milan Historical Museum. Sandusky is 10 miles from my property where there is a mall with Sears, Macy's, and other stores. Cedar Point theme park and resort is 12 miles from my property, Amusement rides, swimming pools, beach on Lake Erie, large hotels, Sawmill Golf and Resort is in Huron, Ohio 5 miles from my property. Many farms in the area. Orchards for peaches and apples are close by in Berlin Heights, OH. Milan, OH has antiques, bar, pottery, and restaurants. It has a very nice library, Edison's birth place, and Historical Museum. Huron River is good for boating and fishing. Central air conditioning has been installed in the entire home. Each bedroom has a pedestal fan and there is one downstairs also. The entire house is heated by a boiler for baseboard heat. It is divided into four zones so all areas do not have to have the same temperature. A Maytag full size washer is in the laundry room for guest use. A Maytag dryer is in the laundry room for guest use. At least four cars can park off street in the gravel drive next to the house. Time Warner internet is bundled with the television. Two towels, two washcloths, and two handtowels are provided for each of nine guests. Soap is also provided. The entire house has wireless internet. There is a sofa that would seat 3 and a sofa that seats 2. The lounge chair is there. If more chairs are needed, they can be brought from the dining room. The dishwasher is close to the sink. Dishwasher soap is furnished. The stove is a four burner electric stove. Stove has a full size oven. Microwave is above the stove. Mr. Coffee maker and filters are furnished. 2 slice toaster is furnished. Contain cooking dishes, and 9x13 glass cooking dish, mixing bowls, etc. A 16 place setting of dishes is provided. Plates, bowls, soap bowls, pie plates and serving dishes are included. Kitchen has many cupboard. It is well equipped. Contains a round table that can seat 8 comfortablely. Television has been converted to all digital so many channels are available from Time Warner. Time Warner Cable service is used. A Blue Ray DVD player is provided. A variety of novels are available for guests to read. There are card games and puzzles for guests to use. The lawn is large enough for ball games to be played. It is away from the road so if safe for children to play. Nearest boating would be in Huron, Ohio or Sandusky, Ohio. The patio has a picnic table for guest use. There are also 8 chairs for guests to use on the patio or around the fire pit. Tennis courts are available in Milan about 3 1/2 miles from property. Huron, Ohio has two very nice courses. They are Thunderbird north and Thunderbird south. Fire pit in back yard. Large back yard for playing sports. In Milan, Ohio there is a Catholic Church, a Methodist Church, and a Presbyterian Church. Also Milan, has a very nice library and historical museum & has the Thomas Edison Home which is open to the public. This is my third time staying here with my family and we love it and feel it's our home away from home! Pleasant accommodations for 9 senior adults. We had a wonderful time all being in the same place. Much nicer than hotel rooms. The ability to cook and eat all together was great. Definitely would recommend. Thank you for the review. It helps others looking for a property to rent to know how previous renters found the conditions at the house and why they liked it. This farmhouse was perfect for our group. It was 30 minutes from Cedar Point Amusement Park, close to the beach and only an hour to the Rock ‘n Roll Hall of Fame. If you go to the beach stop at Berardi’s for dinner, it was amazing! The people in the town of Milan were friendly. If you need to know the quickest way to get anywhere ask Jim. He was very helpful. We left a pillow at the Farmhouse and Pat was sweet enough to call me and offered to mail it to me. The only negative was that the house only had one tv. This farmhouse is definitely worth staying at! We attended a family reunion in Vermilion, Ohio and our stay in this home was perfect for my family. It was very clean, well equipped, quiet, and very comfortable. We are planning on renting again next year! $300 security deposit required FromOctober 31, 2014 to May 24, 2015 the property is available for rent by the month also. The rate for a month is $1200 with a $1000 security deposit. This includes heat, water, electricity, internet and cable. The house is furnished except for linens and towels. Weekly rate is $800 with a $300 security deposit. Nightly rate is the same as peak season.